Easily transfer liquids with this Vollrath 84780 stainless steel 64 oz. funnel. This funnel is a great way to fill squeeze bottles with your house dressing or sauce. You can even fill canning jars with jelly or jam straight from a sauce pan without the hassle or worry of spilling hot liquid. Keeping a variety of funnels on hand adds efficiency to your kitchen and helps keep spills and messes to a minimum for less cleanup and wasted product. 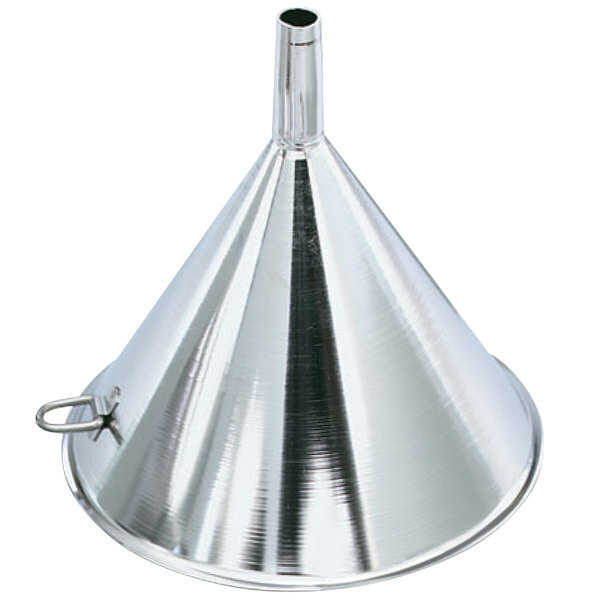 Made of durable stainless steel, this funnel is less susceptible to scratches and it's easy to clean. Plus, it's non-corrosive for a long-lasting addition to your kitchen. With a capacity marking for easier selection, you can choose the right size funnel for every task. A hanging ring on the outside also allows for easy, convenient storage so you can keep an organized kitchen!